We sell uniforms tailored primarily by the Quartermaster Shop from Port Huron, Mi. The Garments we sell are the highest quality available today. Careful attention is paid to every detail to ensure museum quality and authenticity as well as wearability. Please adhere to our ordering instructions so that we may deliver proper fitting garments the first time. Don't guess. Give modern clothing sizes in the space provided. Usual shipping time on custom orders is 8 - 12 weeks. Common sizes and items off the rack can be shipped immediately. Please also note that larger or odd sizes could cost extra. Buttons are included in the price of each garment. 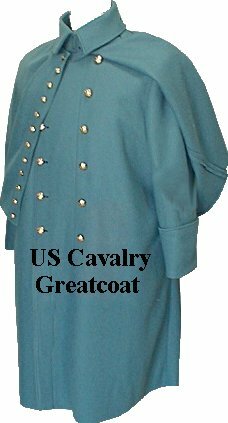 UNION ENLISTED FOOT GREATCOAT ( for Infantry, Heavy Artillery and Engineers) The Foot style Greatcoat is single breasted with a standing collar and has an elbow length cape. Our coat is made of quality 21 oz Sky Blue wool with a heavy cotton jean body lining that extends below the waist. An optional wool body lining is available at extra cost. (Click options button below). Features include cuffs that can be turned down, split back seam, two-piece belt have two buttonholes and one button for waist adjustment. The hem is left raw as per originals. Five button front, 6-button cape, one button on the belt in the back. US General Service buttons are supplied but not sewn on. 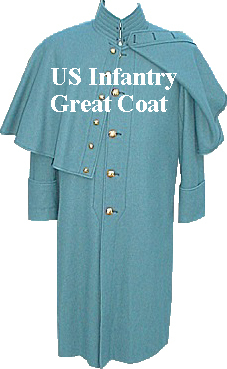 Greatcoats for either branch can be had in Dark Blue Wool as well (Non-regulation) at the same price. Dark blue was VERY RARELY used except for militia and private (Non Military) applications. For Officers Great Coats or Special Needs, please call the shop. Button note: All of our coats and trousers come with buttons included. US - Eagle buttons, CS your choice of buttons specified. See our big catalog for more details. For shirts and accessories, please refer to our SHIRTS and ACCESSORIES page. Button Note- All of our coats come complete with buttons. US coats come with appropriate eagle buttons. CS Coats come with your choice of the following - CSA or Block "I" "A" or "C"
All Oversize, Custom, and Special Orders MUST be paid in advance. No refund is allowed after the material is cut, Please refer to our ordering instructions for details, or give us a call. Want To Order Our 64 Page Full Color Catalog?